Find your very own seaside home away from home when you stay at Maisons Sur Mer. This North Myrtle Beach resort is located on Shore Drive and is nestled right against the Atlantic Ocean. This South Carolina high-rise consists of levels upon levels of furnished condominiums that provide spectacular views of the shoreline and beach town below. It is no doubt that a sandy setting like Maisons Sur Mer is the perfect backdrop for a North Myrtle Beach vacation. Planning a family reunion, golf outing, or girly getaway? 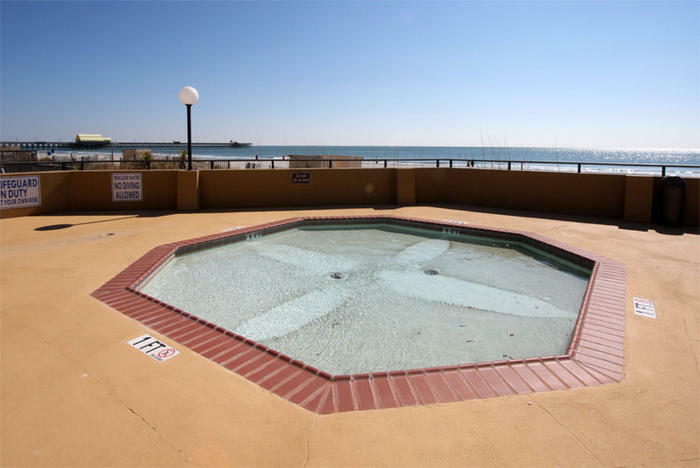 This North Myrtle Beach resort has plenty of rental choices that are sure to fit your needs. Inside, this South Carolina resort features a plethora of North Myrtle Beach condominiums, each with its own décor and layout. Therefore, you will be able choose the rental condominium with enough space and amenities to provide you with the perfect vacation. Each beach condominium comes complete with an array of amenities, including a dishwasher, a washer and dryer unit, and much more. The walls of these South Carolina rentals echo the coastal colors that you will find outside your window. You can also ditch the droning alarm clock, because when you stay at this beach rental, you will wake up to the sound of crashing waves outside your window. You can also start off the day by stepping out onto your outdoor balcony and taking in the cool sea breeze. These North Myrtle Beach rental condos also feature gourmet kitchens complete with modern amenities that make anything from whipping up simple snacks to seafood dinners easy. Each one of these multi-layout condominiums also boasts a dining room, spacious living room, and comfortable bedrooms. You are sure to find the perfect fit when you make this beach resort your vacation destination. You will also find that this South Carolina vacation resort provides you with plenty to do. If you do not feel like cooking, be sure to grab a bite at the restaurant housed in Maisons Sur Mer. This restaurant includes a large selection of foods that are sure to satisfy your taste buds. If you want to get a little competitive, you and your family and friends can test your skills in the game room. Here, you can have an air hockey tournament, play a round of billiards, or become a racecar driver in a video game. Maisons Sur Mer is simply the best choice for a fun vacation. Elliott Beach Rentals is not affiliated with onsite management or the HOA of Maisons Sur Mer.